As you age, having strong bones becomes essential in order to continue living an active and healthy lifestyle. Sadly, there is a nearly inevitable loss of bone density associated with aging, which is why it is very important to support strong and healthy bones. Although calcium is the mineral that comes to mind for most people when they think of supporting bone health, there is a lesser-known mineral which has powerful bone-supporting properties, strontium. Chemically similar to calcium, strontium plays a role in bone formation and helping to maintain healthy bone mineral density. Many people only get small amounts of strontium in their diet, so supplementing with strontium can provide great support for aging bones. That is why Bone Rescue contains 680 mg of strontium, along with additional ingredients to help support and promote healthy bones. These include well-known bone-supporting vitamin D3 and magnesium. 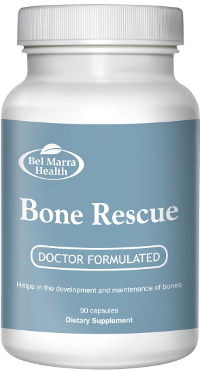 Bone Rescue is an ideal way to support your diet for healthy bone maintenance. DIRECTIONS Adults 50 years and older. Take two capsules in the morning and one in the evening, or as directed by a health care practitioner. Take with small quantity of food. Take at least two hours before or after meals, calcium supplements or milk. For use beyond 6 months, consult a healthcare practitioner. Vitamin D and Calcium supplements should also be taken if dietary intake is inadequate, or is recommended by a healthcare practitioner. WARNING Do not use if pregnant or breastfeeding. Do not use if you have kidney disease Do not use if you have, or are at high risk for, blood clots (e.g. if you are temporarily or permanently immobilized, over the age of 80, taking birth control pills, etc. ), heart disease and/or circulatory problems (e.g., heart attack, peripheral arterial disease, stroke, high blood pressure, hyperlipidemia and diabetes etc.). Discontinue use and consult a healthcare practitioner in case of rash or hypersensitivity reaction as this may be a sign of a serious allergic reaction (e.g. DRESS Syndrome, or Stevens Johnson-Syndrome).